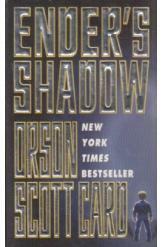 Ender's Shadow by Orson Scott Card, Sci Fi. An orphan struggling to survive on the streets of Rotterdam, tactical genius Bean is recruited to train along with Ender Wiggin for a war against the alien Buggers. In the wake of that war, much of Ender's legacy is left for Bean to follow. Part of the "Ender's Game" series. Book is in good condition, all pages intact.